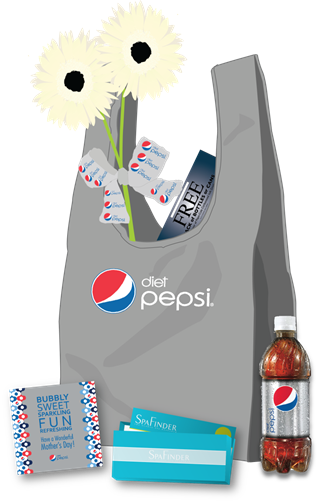 "This Mother’s Day weekend, Diet Pepsi will be surprising and refreshing their biggest fans – moms! While you’re out and about, make sure mom has a Diet Pepsi in hand because this Mother’s Day weekend, street teams will be stationed in 15 cities nationwide, scouting out moms and rewarding them with refreshing treats – like spafinder.com gift cards and custom totes filled with goodies, coupons – and of course some Diet Pepsi! Keep an eye on the Diet Pepsi Facebook and Twitter pages throughout the weekend for updates and visit http://on.fb.me/IRXRBk to see if we’ll be hitting a city near you! And for some added fun – from now through May 13, consumers that buy three 12-packs of Diet Pepsi save $3 on flowers for Mother’s Day at SuperValu stores in these 15 cities." I hope some great moms in this cities are able to take advantage of this offer! Disclaimer: I received no compensation for this post and as always all opinions are my own.